My life takes place within the confines of the neighbourhood where we live, the neighbourhood where my daughter goes to school and periodically the grocery store and markets. This week is Spring Break for my daughter which means that We are venturing further afield but for the heart drops locations up to now have been limited to the places that I find myself in often. This means that sometimes I'll be dropping in similar locations and others I'll be dropping farther afield. Today for instance I'll be leaving a heart to be found in Science World and possibly another in Stanley Park later this week and again if we make it there; the garden centre. I think you get the idea. Anyway, last Friday I revisited our local public Library and left a heart in the Poetry section.The Quote was from Bob Marley: One love, one heart, one destiny. It's a simple and beautiful poetic message of love, acceptance and peace. 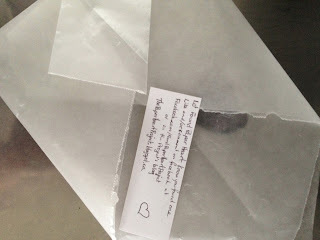 Each heart quote that goes with a heart is hand written on a small slip of paper kind of like a fortune cookie fortune. I write the quote and who it's attributed to on once side and invite the person who finds it to like and comment on the facebook page or on this blog to let me know that it's been found. There's a lot of information to write on such a small piece of paper but I've managed to get it all on and I think legible. I could type them out and print the quotes and links but I like the intimacy of a hand written note for now. While I'm on that topic, if you haven't seen the facebook page please do. Also I'd love it if you liked it too but no pressure; honestly. As I've been moving forward with this project I've had a few ideas of how to expand it, and get more people involved. While I fiddle with these ideas I'll keep on keeping on. I'm patiently awaiting contact from someone who has found a heart but truly the act of putting them out there is what it's all about. I sell fine art photography of natural phenomenon, landscapes, cityscapes and nature on my Etsy shop TMCPhoto.etsy.com I also create mixed media paintings, cards and ornaments at a second Etsy shop PeanutButterPie.etsy.com. All photographs used in these posts are the property of TMCPhoto with the exceptions of linked photos used in features and linked in posts I there are three blogs I curate/write here, and one that I help out on. One is a little about me, my family life, my creative life and how they intermingle. I do features on artists and also tutorials. One focuses on my year and a day of study towards my dedication to the Goddess. The third and newest is a chronicle of a public art project I have started. The one I help out with is the husband's and is tied into his stomp box building business. I help out there painting the boxes for one a kind boxes. I sometimes post in teh blog if he's too busy.